Upon leaving my residency at RRU, I have a better understanding of my role as an educator. I am able to say that my epistemological beliefs are rooted in interpretivism with a teaching style based on social constructivism and parts of connectivism. As a visual learner, working collaboratively in a group environment while being able to construct my own sense of knowledge is how I learn best. I have found that in the past, I have tried to pass on those preferences to my students in hopes that they learn in the same manner as I. What I gained from my experience at RRU was discovering my epistemological beliefs of knowing and gaining a greater understanding about how the ways in which I learn effect the way I teach; whether tacit of explicit. It is crucial for an instructor in the digital age to be as technically savvy and skilled as their students in order to provide knowledgable answers for the questions raised by his/her students. My role as an educator may be more important today in the digital era than ever before. Being in the profession of multimedia and an educator in the field of media studies, it has allowed me to learn and deliver content in a variety of ways. In the digital age, the skills, and demands of this ever-evolving climate are changing drastically at a greater pace than before. “Many educators place critical importance on the social aspect of learning. Ideas are encouraged to be developed between the perspectives of teachers, classmates, peers and colleagues” (Bates, 2015, p. 52). There is no doubt about the importance of the teacher as a facilitator in today’s educational system. However, with the abundance of technological advancement in our current educational climate, the real question is if teachers are equipped with the up-to-date skills necessary to assist their students in learning technologies? In addition, are teachers willing to adapt to the advancements of technology and implement them within their current systems? It is crucial for an instructor in the digital age to be as technically savvy and skilled as their students in order to provide knowledgable answers for the questions raised by his/her students. Moreover, it appears to be even more important for educators to help navigate students through their educational careers to decipher between the good and bad knowledge that is readily available online. Technology is evolving as we speak. Therefore, teachers must have the ability to grasp new concepts quickly and deliver those concepts to their students. In the scope of web-based-learning, technical skills and critical thinking skills are also important. Teachers must learn new ways for facilitating better learning experiences within traditional classrooms and online environments. They must effectively utilize a variety of learning styles and digital media to enhance student engagement and understanding. After my learning experience on residence at RRU, I realized that in order to be an instructional designer within mobile and distance learning, I have a greater responsibility to fulfill the needs of my students as well as being versed in a multitude of web-based communication tools, languages and learning theories. Although teachers are no longer the primary source of information in the digital age, (which we never were the only source of information) our responsibility is to now contextualize information and guide students in the direction of useful information. 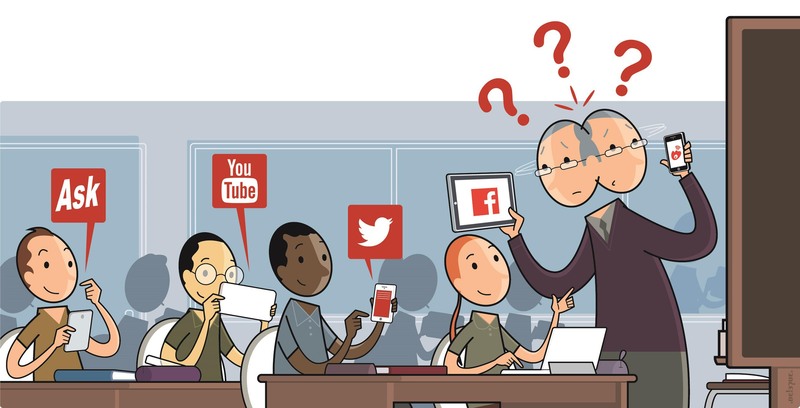 Even in the advent of Google, YouTube and Wiki’s, the engagement and guidance of educators scaffolds information in ways that students using technology and peer groups do not. There is no question that if teachers lack technical skills, they will not be able to contribute effectively with their student’s. However, having conventional teachers with the technological skills to enable the facilitation of knowledge in the digital age is paramount. Compassmag.3ds.com,. ‘TEACHING TEACHERS / Education / #5 / The 3DEXPERIENCE Magazine – 3DS Compass Mag’. N.p., 2015. Web. 13 Aug. 2015. I have no idea what that means but it sounds awesome! Kidding aside, this is a great article and I look forward to learning with you over the next few months.